There are particular screening processes notaries take to determine a signer's identity and their understanding of what they are signing and willingness to sign. Doing this type of screening over the internet makes the screening process more difficult. And the current security processes the RON movement utilize for notarizing real estate transactions have yet to be tested in any court of law. Los Angeles, CA, March 27, 2019 --(PR.com)-- The Founder of NeedANotary.com, Joanne Beverly, has noticed a significant push to move the process of notarizing documents from in-person to over the internet (coining it as the "RON movement" which means Remote Online Notary movement). "The organizations pushing for this move are marketing online notarization as bringing the 'old school' process of in-person notarization into a modern. convenient, 'business transformation' by having customers meet over the internet to get their documents notarized," she states before asking, "But at what cost?" Consumers, courts, and law officials understand that Notaries Public are trusted individuals commissioned by their states to help protect the public from fraud when they place their seal on documents. "Through the process of notarization, Notaries deter fraud and establish that the signer knows what document they’re signing and that they’re a willing participant in the transaction." (Citation from NationalNotary.org) There are particular screening processes the notaries take to determine a signer's identity and their understanding of what they are signing and willingness to sign. Doing this type of screening over the internet makes the screening process more difficult. And the current security processes the RON movement utilize for notarizing real estate transactions have yet to be tested in any court of law. Remote Online Notarization ("RON") has yet to prove it deters fraud. In an online notarization, the process to identify a customer shifts away from notaries public to a third party process that utilizes "modern tools that validate identity online, such as credential analysis and knowledge-based authentication" Notarize.com citation. However, these "modern tools" can be manipulated by "modern" identity theft fraudsters who use the internet to find the security question answers to bypass the validation mechanisms used in RON. With online notarizations, the notary public doesn't have the ability to physically examine identification to independently authenticate the identity of the signer. And with another high-tech fakery like "deep fake" video, the notary public can be fooled into certifying the signature of a fraudster. "RON" makes it difficult for notaries to provide evidence for law enforcement. The National Notary Association has indicated in their the 2017 "Model Electronic Notarization Act" the need for online notarization to require the capture of principals’ and witnesses’ thumbprints for all real property documents. (Ch 9, § 9-4 Journal Entries, pg. 51) NNA asserts that many impostors will be deterred from committing forgery because they will not want to leave a thumbprint behind in the notary’s journal as proof of their attempted crime. Prosecutors often use the journal evidence to bring forgers to justice. Currently, no RON implementation has provided the ability to obtain thumbprints. California currently requires notaries to obtain thumbprints for notarizations dealing with deeds and power of attorneys. However, the current California online notarization bill, AB 199, has removed this requirement. If this bill passes into law as it is currently written, it will be more difficult to provide evidence of fraudulent notarized transactions. 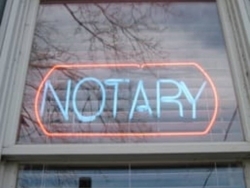 "RON" diminishes the ability for Notaries Public to determine the willingness of signers. To determine signers understand what they are signing and their willingness to sign, notaries public observe the nuances of the signers' non-verbal communication because nonverbal communication tends to do the work of communicating emotions more than verbal. In the online environment, it is more difficult to pick up what is being communicated nonverbally. Notaries may not be able to hear the signer's tone of voice, see their gestures, or know if someone else in the room is intimidating them. The ability to determine the signers' willingness and understanding to sign is therefore diminished when the parties engage over the internet. As the Vice President of Old Republic Title National Underwriting Counsel wrote: "Caution is the watchword here. State, federal and bankruptcy courts have invalidated mortgages and other documents due to defective notarizations. When that happens, the lender's lien position is not only jeopardized but the enforceability of the mortgage itself is put at risk.” Current processes used by RON are not entirely equipped to handle safeguarding fraudsters in the way in-person notarizations are. The process of notarizing documents has been going on for hundreds of years and there is no upcoming end to this process. Before states hop on the bandwagon of RON, the lawmakers should assess their current process and determine if the movement to online notarizations will benefit or provide a detriment to their current process. Federal laws in recent years have pushed to protect consumer privacy and security, lawmakers would benefit to consider the costs and benefits of RON for their constituents. Notaries Public are trusted by the public at large, courts, businesses, and law enforcement. There should be no reason to rush towards an untested process that may very well create more consumer fraud and abuse which can lead to distrust of the notary public profession. How notaries serve the public seems to be working just fine going on several hundred years now. Let’s take a step back and focus on considering all avenues to safeguard the consumer in every way. When it comes to notarization, that is the ultimate purpose. At NeedANotary.com, you can conveniently search, book, and pay for notary services with notaries who follow their states' "old school" ways.